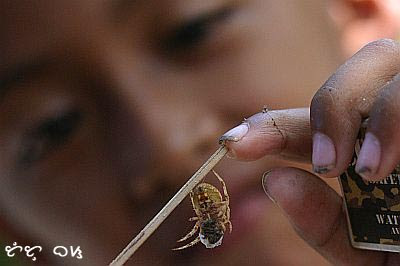 Playing with spiders is a popular past time and hobby of many kids particularly in the provinces where many species of "toy" arachnids can be caught in homes, fields and mountains. 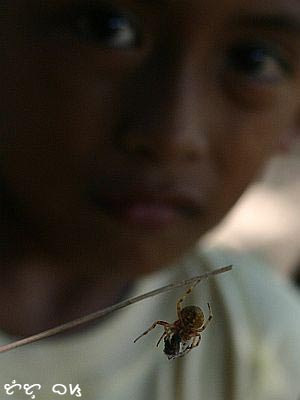 Some people even make a living selling fighting exotic spiders to children near churches and public squares and making spider fighting a part of Philippine culture similar to the grown-up's addiction to sabong (cockfighting). Tutubi, in his childhood at one time, got hooked on it but mostly with spiders caught at home, used a stick from a walis tingting (broom made from sticks of coconut leaves), pitted two spiders on a death match. He espied a spiderman doing the same thing somewhere, and using using his Canon 50mm lens, took pictures of the eight-legged creature on stick with the other spider already dead and "mummified" with spiderweb. 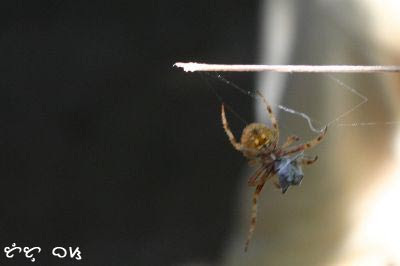 Note: Tutubi does not advocate nor promote catching spiders particularly the rare species, knowing the importance of spiders to ecology as well as the danger of the depletion of spider population in the Philippines can lead to to an increase in number of mosquitoes and other natural preys of spiders. Philippine spiders are mostly small, non-dangerous ones unlike the popular and venomous tarantulas and poisonous black widows usually seen in horror movies. Tarantulas can be bought in several exotic pet shops in Metro Manila. My brother and I would bike to the barrio and catch spiders in the fields (mostly sugarcane). I was a girl who enjoyed spider fighting. Don't judge, twas the culture and it was fun too. I watched about spider fighting in National Geographic channel and I'm really impressed with how those little 8-legged creatures can fight. I used to watch boys fight spiders, when I was a kid back home. That was fun for them when the winning spider wraps the loser with its web. You are right about the impact of spiders on our ecology, though. 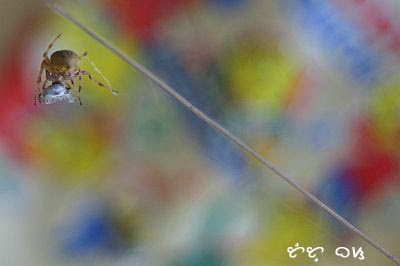 Just visit my blog and leave ur blog info there..thnx advance..
Used to play these spiders when I was a kid. We always thought that those we catch from the trees were stronger and fiery fighters and the ones in the house ceilings were weaklings ! pusa, stereotyping it as a male-only game, heh? I tried to photograph this game in the past but I did a very bad job ! those prime 50mm lenses are so good. I have a 1.8. I thnk any form of so called sport that envolves humans using other species is just pure ignorance & allways shows our barbaric past is not that far away....learn to observe & it is good to judge & ultimately put an end to all cruelty to all species. those of us who care are growing because we really do want to be a better species & more loving & more understanding & less religious for that is the excuse many use. anonymous, right you are. I admit i used to do this when i was a child. Now I pity those spiders. they should have been left in the wild to hunt their prey, including dangerous insects.